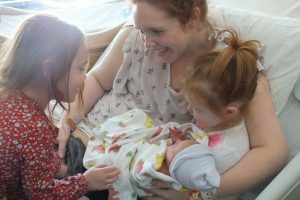 After days of what I learned was prodromal birthing time (Hypnobabies word for labor) I wasn’t sure I’d know when active birthing time was really beginning, despite it being my third pregnancy. I spent a better part of Sunday, the 19th, doing various techniques from Spinning Babies to encourage baby girl to get into an engaged anterior position, including forward-leaning inversions, dip the hip, abdominal lifts, hip circles on the yoga ball, and watching some Gilmore Girls on my hands and knees. I was so over having these strong, really need to concentrate pressure waves (Hypnobabies word for contractions) that I’d given up on formally timing them, but I would try to glance at the clock if it was convenient to get an idea of when the next one might be happening if things were going to start to progress. That evening at 7:05 I had a nice long pressure wave and shortly after my three year old came to tell me that dinner was ready. I made my way out to the kitchen and was waiting for a moment when I had another pressure wave, sooner then I’d been expecting. In my exhaustion I decided that I didn’t want to eat with the rest of the family, I just wanted to go back to the quiet bedroom to try to relax. Instead of relaxing though pressure waves started coming frequently and were long. I put on my Hypnobabies tracks and found an app to download on my phone to track the waves, as they seemed to be coming pretty quickly. Soon my husband came in to offer me a cupcake for dessert, but I declined as I was really finding a need to focus on my hypnosis and my waves. I told him that I was having some consistent waves and they were pretty intense. He left to go start getting the kids ready for bed and he said he’d check in a bit. After about 45-50 minutes I knew it was time to go to the hospital. Originally my doctors said to leave for the hospital when my pressure waves were about 6-7 minutes apart since this was my third and my second VBAC. When I realized on my tracking app that my waves were over a minute long and happening every 5 minutes or so I felt more confirmation that it was time to go. My husband came into our bedroom to check to see if I’d be up to coming out to say goodnight to the girls and possibly sing some lullabies to our youngest, but instead, I told him we needed to leave to go to the hospital. He got right to calling our doula to meet us there, calling the hospital to tell them we were on our way, and getting our stuff and me to the van. I switched over to my headphones with my Hypnobabies tracks (Easy First Stage, which is Hypnobabies main birthing day track) playing and away we went. We got to the hospital around 8:50 and thought it was a nice coincidence that the room they had me go into was the same one I was in when I had my last daughter. Pressure waves were happening quickly, but I focused on keeping my muscles relaxed and my favorite affirmations. I was excited to think that these waves were actually bringing my baby closer to being in my arms. After an IV port was put in I was checked and surprised to find I was at 7, almost 8 cm, the baby was low, but my membranes were still intact and not yet bulging. I continued to listen to my hypnosis tracks, first on a birthing ball with my husband behind me and our doula in front of me helping to keep me calm, relaxed, and focused. That support might have been one of my favorite parts of my birthing time. I had mentioned that earlier in the day sitting on the toilet was comfortable for me, so the nurse brought in the birthing stool for me to try. I thought I was going to really like it, but I hated it. The hardwood was terribly uncomfortable and I moved off that as soon as I could. I had originally visualized myself giving birth on the stool, but now I knew that wasn’t going to happen with how hard it was. When I begin to feel more pressure the doctor was called in to check my progress. I thought that my membranes had ruptured earlier on the birthing ball, but it must have just been a small leak because when the doctor came in she was sitting on the end of the bed waiting for my wave to finish so she could check me, and the next thing I know I feel a slight crack/pop sensation than a big gush. It was a déjà vu from my birthing time with Sophia. However, when the doctor checked me this time I was complete, with the exception of a slight anterior lip. She was explaining that she could move it and I could push the baby past, but as she was talking my body had another wave and the doctor said to the nurse never mind the lip was gone and I was fully complete. Soon my body began to have pushing waves and I tried to find the best position for me. My husband put on the Pushing Baby Out track (Hypnobabies hypnosis track just for comfortable pushing) but got flustered because he couldn’t figure out how to put the track on repeat, and between pushing waves I explained what he needed to do. I started on my right side, but then soon I turned and hopped up to face the back of the bed. 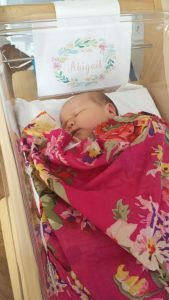 As I was pushing I heard the doctor telling my husband that the pediatrician might need to see the baby first after she was born because there had been meconium when my water ruptured. Soon I began to feel the powerful stretching as baby girl was crowning, another new sensation. 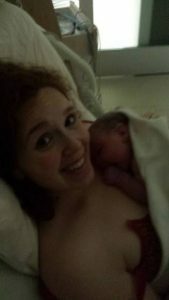 I wanted that part to be done with as soon as possible so I could finally hold my baby! A few pushes later her head was out, forehead first, and then one more push for her shoulders/body and I felt another gush of fluid follow her out, along with a hearty cry. After about 25 minutes of pushing, I turned around and picked up my baby girl! I don’t remember exactly what I said, but I think it was along the lines of “You’re finally here!!! Hi, baby girl, we did it!” ☺ Abigail Louise was born at 12:14 AM on March 20th, weighing 9lbs 3oz and 21 inches at 40+5.